Castle Drogo is a country house near Drewsteignton, Devon, England. It was built in the 1910s and 1920s for Julius Drewe (businessman and founder of the Home and Colonial Stores) to designs by architect Edwin Lutyens, and is a Grade I listed building. Castle Drogo was the last castle to be built in England, and probably the last private house in the country to be built entirely of granite. The castle took many years to complete, with the First World War and the economic downturn causing many delays. Castle Drogo was finally completed in 1930, considerably reduced in scale from Lutyens's 1911 designs, and only a year before Julius died; he had, however, been able to live in the house since around 1925. The stately home borrows styles of castle building from the medieval and Tudor periods, along with more minimalist contemporary approaches. Note the stone mullion windows akin to Hardwick Hall and Montacute House. A notable feature is the encasement of the service staircase, around which the main staircase climbs. Its defensive characteristics are essentially decorative. Additionally, the castle had electricity and lifts from the outset, with power being supplied by two turbines on the river below. The gardens and view of Dartmoor from the castle were spectacular. Dartmoor is a magical landscape, and one of my favorites of the UK. This picture doesn't do it justice. I stayed in the town next to the castle in the village inn and it was truly authentic Lord of the Rings stuff. When I return to the UK, I would love to explore Dartmoor in more depth as there is a wealth of history here. 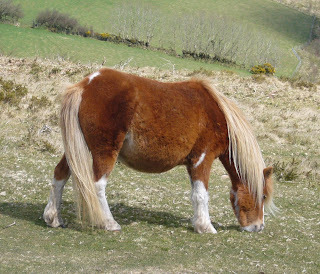 The adorable Dartmoor pony is also a famous breed of pony from this area.